Based at the University of Colorado-Boulder, the National Snow and Ice Data Center (NSIDC) has no shortage of skiers experienced enough to know good—and bad—ski conditions. “Warm days plus cold nights can really make conditions painful,” opines software developer Matt Fisher. “You get the snow warming up during the day then icing over at night. It’s harder to keep control in icy conditions and when you fall, it really hurts.” Heidi McCann, coordinator of indigenous knowledge exchange agrees, adding that the most desirable snow has low water content, and ideally, eight or more inches of fresh powder. A skier enjoys powder at Jackson Hole, Wyoming. CC license by Flickr user Zach Dischner. Hazards to skiers during this period include hoarfrost, that can form under calm, humid, clear conditions; and ice lenses caused by surface melt or rain-on-snow events. Any snow accumulating on top of these flaky or icy layers is prone to avalanche. 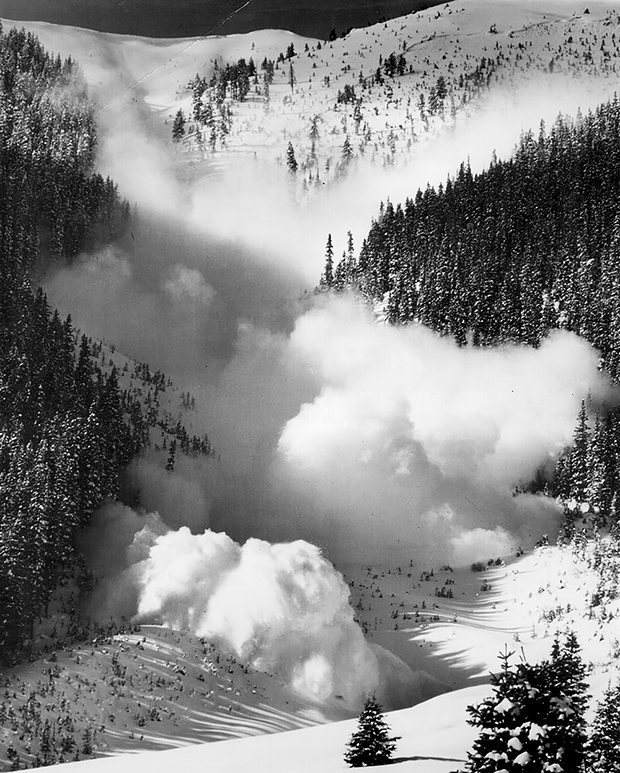 Depth hoar, which often forms in a shallow snowpack, can result in especially widespread instability throughout much of the remaining the season, potentially leading to catastrophic avalanches. While ski resorts try to mitigate avalanche risks, backcountry and cross-country skiers outside resorts must watch out for themselves. Slope, terrain, and snowpack conditions can all contribute to avalanches. © by Richard Armstrong, NSIDC. Moon isn’t speculating. Released in 2017, the U.S. Fourth National Climate Assessment provides a comparison of 1986–2016 temperatures to those for 1901–1960. The comparison shows an increase in average temperature across 95 percent of the nation’s land surface, and the temperature increases have been most widespread in winter, 1.5°F in most places. The number of cool nights has also declined, and in much of the western U.S., the decrease is about two weeks. Ski resorts dot a substantial portion of the contiguous United States (CONUS), from Virginia northward to Maine, across parts of the Upper Midwest, and from the Rocky Mountains westward to the Pacific Coast. In parts of the western United States, the ski industry comprises a significant chunk of local economies, especially in the Rocky Mountains. 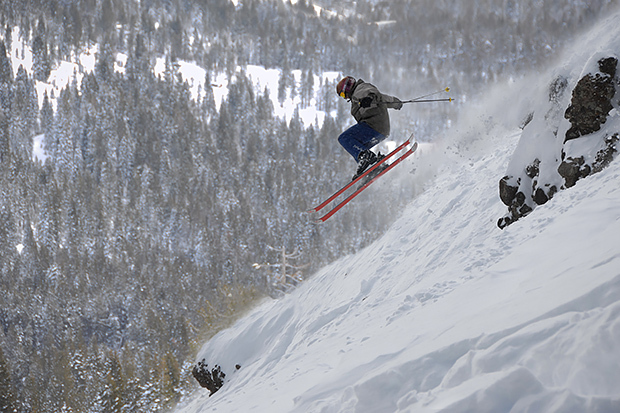 A confident skier speeds down a steep slope at Lake Tahoe. CC license by Aaron Feen. In the 2017-2018 ski season, the problem extended months after the holiday season. Around April 1, McEvoy said, snowpack in the region was about 75 percent of normal. 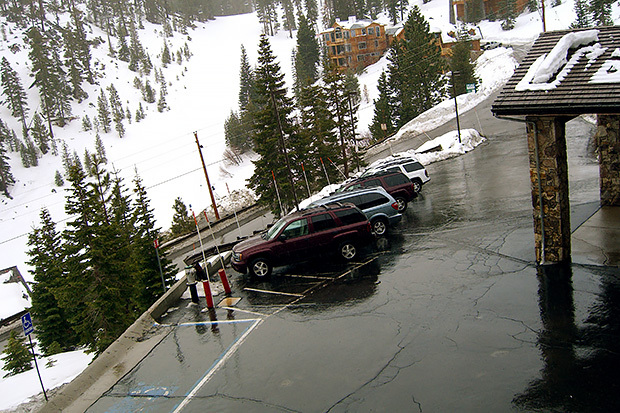 “It doesn’t sound that bad, but almost all the snow came in March.” In February 2018, the Yosemite Ski and Snowboard Area offered its season pass holders the option of rolling over their passes to the following winter, or taking refunds. Meanwhile, the higher-elevation Mt. Rose Ski Area adopted a new slogan: Where the snow is! McEvoy sees reason for concern, and he has more than anecdotes from recent lackluster ski seasons. He points to the Sierra Nevada Summary Report. Part of California’s Fourth Climate Change Assessment released in 2018, the report describes long-term warming and decreasing snowpack. The problem isn’t confined to the Sierra Nevada. A 2018 study in Climate and Atmospheric Science states that western U.S. snowpack deficits are worst in springtime, in the Pacific states, and in places with already mild winters, but also identifies declining snowpack trends “across all months, states, and climates” in the West. 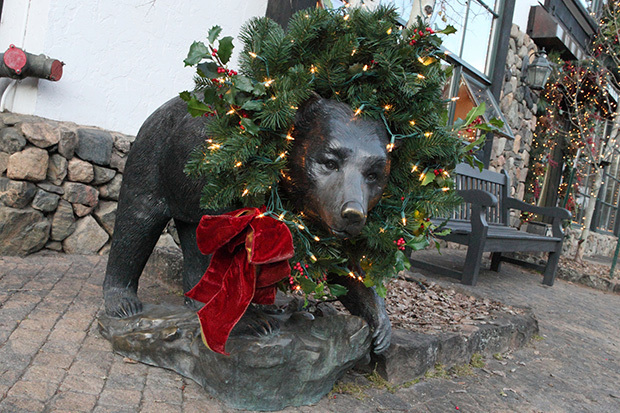 A holiday wreath adorns a bear statue in Vail, Colorado. CC license by Flickr user Sam Howzit. That’s the elevation zone that’s changing in a lot of places. The Sierra Nevada portion of California’s Fourth Climate Change Assessment predicts that, by the end of this century, temperatures in that region will rise an average of 6°F to 9°F if carbon dioxide emissions continue increasing at a high rate (RCP8.5), raising the rain-to-snow transition anywhere from 1,500 feet to 3,000 feet. The report issues a blunt forecast: likely elimination of snowpack below 6,000 feet elevation, and snowpack reductions exceeding 60 percent across nearly the entire Sierra Nevada range. Elevation will play a key role in the future fate of United States ski resorts. McEvoy and one of his colleagues at the Western Regional Climate Center, researcher Benjamin Hatchett, coauthored a 2017 study examining Sierra Nevada precipitation from 1951 to 2017, identifying multiple causes for regional “snow droughts.” Among those causes, they identified rain-on-snow events. From 2008 to 2017, the fraction of precipitation falling as snow declined at a rate of 3.5 percent per year. Hatchett also led another study on rising snow lines in the Northern Sierra Nevada. Riding the gondola to the summit while soaking wet from rain might be unpleasant. Skiing right off the edge of the snow on your way back down might be even worse. Since the 1960s, overall North American snow depth has declined, according to the Fourth National Climate Assessment, and the snow season’s maximum snow depth has occurred a week earlier on average. The Great Lakes snow belt regions experienced some increases through the late 1970s and early 1980s, but since then, the trends have reversed in some of those same areas. Across the CONUS as a whole, total snowfall largely declined between 1930 and 2007, according to a 2009 study cited by the Environmental Protection Agency. That study examined long-term snowfall-station data, finding that snowfall totals dropped by more than half in the Northwest, and also declined sharply in the Southwest. Rain ruins the fun at Lake Tahoe. CC license by Flickr user Armistead Booker. Authors of Fourth National Climate Assessment point out that predicting regional and local changes is harder than predicting average changes across the CONUS. But some forecast efforts have taken on that challenge. Based in Boulder, Colorado, Cameron Wobus is a research scientist studying hydrology and environmental data, among other disciplines, He has long worked with the Climate Division of the Environmental Protection Agency, examining possible economic impacts of a warming climate. He also likes to ski. The impact of climate change on the ski industry struck him as a logical subject to examine, and in 2017, he led a study on the projected climate impacts on skiing and snowmobiling across the United States. To run the models, he enlisted Eric Small, a professor in the Geological Sciences Department at the University of Colorado-Boulder. 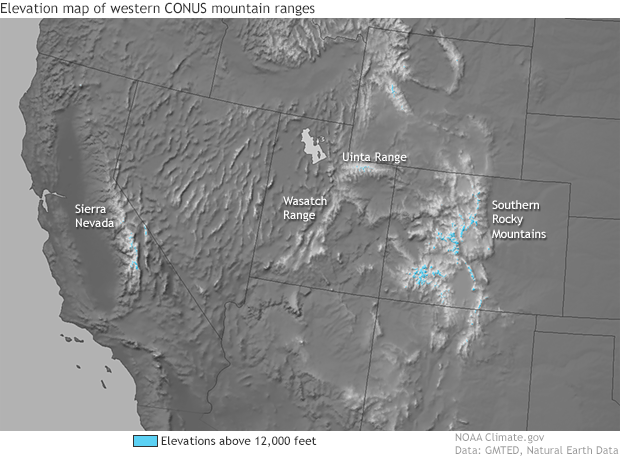 Wobus, Small, and their coauthors simulated natural snow accumulation at 247 winter recreation destinations across the CONUS. They incorporated five climate models and two emission scenarios: RCP4.5 (moderate emissions) and RCP8.5 (high emissions). In this as in other studies, high-emission scenarios present more worrisome forecasts than moderate-emission scenarios, especially toward the end of the century. “Since this was a national-scale study, we had to make assumptions about elevation and slope,” Wobus says. “We took data from a digital elevation model then, for each ski resort, we assumed the same elevation and slope for the entire resort, but that’s obviously not the case. In reality, the topography is more complicated. There will be pockets in each resort that do better or worse than our projection based on, for instance, whether it’s a north- or south-facing slope.” But the study produces enough detail to show widely varying outcomes in different parts of the country. “I was a little surprised at how dismal the results look in the Northeast where I grew up. By the end of the century, people will not be skiing in New England,” he said. The Sierra Nevada fare better. The Rocky Mountains fare better still, thanks to their overall high elevation. The Wobus study is not an outlier; the Climate Impact Lab has published projections for days below freezing, and those results roughly overlap with those of the Wobus study, with the Rocky Mountain ski resorts surviving longer than other areas. But although the Rocky Mountains fare better than other skiing locations, Wobus, Small, and their coauthors found negative impacts in practically every winter-recreation resort, including those in the Rocky Mountains. 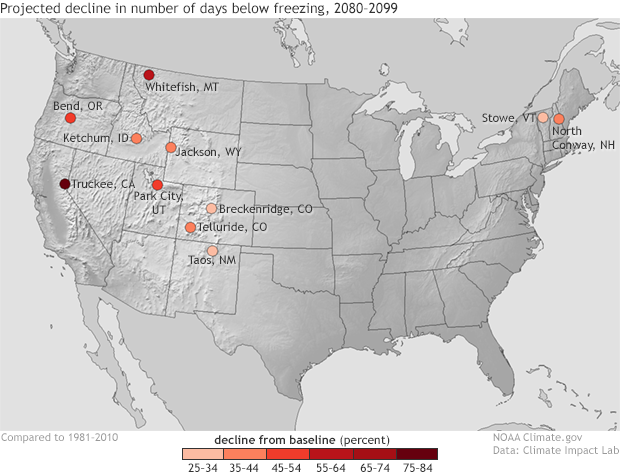 Projected days below freezing at selected climate stations. Derived from Climate Impact Lab. But although the Rocky Mountains will stay snowy longer, they will still feel impacts, according to a 2018 update to the 2014 Climate Change in Colorado assessment. And if temperatures continue warming long enough, Colorado’s snow will begin to be more like California’s Sierra cement, which could wipe the smirks off Colorado-champagne skiers’ faces. Among the opinions offered at NSIDC, software developer Julia Collins has some thoughts on snowmaking. She’s not a fan. “If the weather is too warm, it doesn’t do any good, and it has a carbon footprint,” she says. 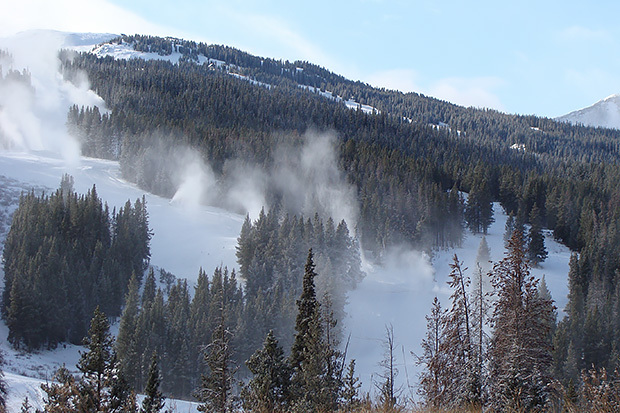 Snowmaking has become routine at many ski resorts. CC license by Flickr user Jimmy Thomas. Even with continued high greenhouse-gas emissions, high elevation will save many ski resorts in the Rocky Mountains. “I think the big result from our study was that,” Small says. “It won’t be true for all resorts, but Colorado should be fine with pretty considerable climate change because of the elevation.” In other places, though, the future of skiing will depend in large part on energy choices societies make in coming decades. Climate Impact Lab. (2018, February 8). America’s Shrinking Ski Season. Accessed October 27, 2018. Dettinger, M., Alpert, H., Battles, J., Kusel, J., Safford, H., Fougeres, D., Knight, C., Miller, L., Sawyer, S. (2018). Sierra Nevada Summary Report. California’s Fourth Climate Change Assessment. Publication number: SUM-CCCA4-2018-004. Environmental Protection Agency. (2016, August). What Climate Change Means for Colorado. EPA 430-F-16-008. Environmental Protection Agency. Climate Change Indicators: Snowfall. Accessed November 8, 2018. Forest Service Rocky Mountain Research Station. (2017, June). General Technical Report RMRS-GTR-362: Assessment of Watershed Vulnerability to Climate Change for the Uinta-Wasatch-Cache and Ashley National Forests, Utah. U.S. Department of Agriculture. Hatchett, B.J., McEvoy, D.J. (2017). Exploring the origins of snow drought in the Northern Sierra Nevada, California. Earth Interactions, 22, 2. doi:10.1175/EI-D-17-0027.1. Hatchett, B.J., Daudert, B., Garner, C.B., Oakley, N.S., Putman, A.E., White, A.B. (2017). Winter snow level rise in the Northern Sierra Nevada from 2008 to 2017. Water, 9, 899. doi:10.3390/w9110899. Hatchett, B.J., Eisen, H.G. (2018, in review). Early season snowpack loss and implications for over-snow vehicle recreation travel planning. The Cryosphere. doi:10.5194/tc-2018-181. KFSN. (2018, February 22). Ski resort in Yosemite says they will not open this winter. Accessed October 27, 2018. Kunkel, K.E., Palecki, M., Ensor, L. (2009). Trends in twentieth-century U.S. snowfall using a quality-controlled dataset. Journal of Atmospheric and Oceanic Technology. 26(1), 33–44. doi:10.1175/2008JTECHA1138.1. Lukas, J., Western Water Assessment. (2018, August). Climate Change in Colorado: Recent Trends, Future Projections and Impacts: An Update to the Executive Summary of the 2014 Report. Mote, P.W., Li, S., Lettenmaier, D.P., Xiao, M., Engel, R. (2018). Dramatic declines in snowpack in the western US. Climate and Atmospheric Science, 1,2. doi:10.1038/s41612-018-0012-1. Ning, L., Bradley, R.S. (2015). Snow occurrence changes over the central and eastern United States under future warming scenarios. Scientific Reports, 5, 17073. doi:10.1038/srep17073. Steiger, R., Mayer, M. (2008). Snowmaking and climate change. Mountain Research and Development, 28, :292–298. doi:10.1659/mrd.0978. The Washington Post. (2014). Mountains of the Olympics. Accessed November 6, 2018. Wobus, C., Small, E.E., Hosterman, H., Mills, D., Stein, J., Rissing, M., Jones, R., Duckworth, M., Hall, R., Kolian, M., Creason, J., Martinish, J. (2017). Projected climate change impacts on skiing and snowmobiling: A case study of the United States. Global Environmental Change, 45, 1–14. doi:10.1016/j.gloenvcha.2017.04.006. Wuebbles, D.J., Fahey, D.W., Hibbard, K.A., Dokken, D.J., Stewart, B.C., Maycock, T.K., editors. (2017). Climate Science Special Report: Fourth National Climate Assessment, Volume I. U.S. Global Change Research Program, Washington, DC.